Posted on April 6, 2019 at 12:11 am. What a great week back to school. We were so excited for our “Skype in the Classroom” event with Dr. Jane Goodall. Children from schools all around the word tuned in to hear about her first work in Africa and her current work now to protect humans and animals. We submitted a few questions which were answered by Jane and Jane Goodall Institute members. We are patiently waiting to receive a copy of the talk and our answers. In the meantime, students have been looking into her “Roots and Shoots” initiative to help students learn more about the needs of animals and the planet to prove that every child can make a difference. 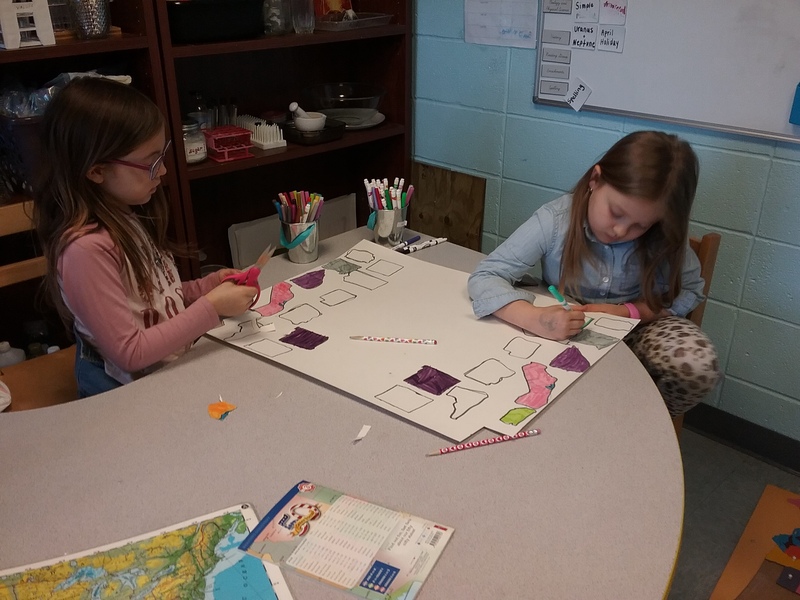 Once we gather all of our information, we are going to vote to see if we would like to join one of the projects to do service for people and animals in our area. This first year student is working with our bead bars to form a decanomial. He has built the multiplication table of ones and is working on building the two times table. Once he has mastered this work, we will go through the decanomial and replace the bars with their commutative property pairs. We will then go through and find the squares of numbers. 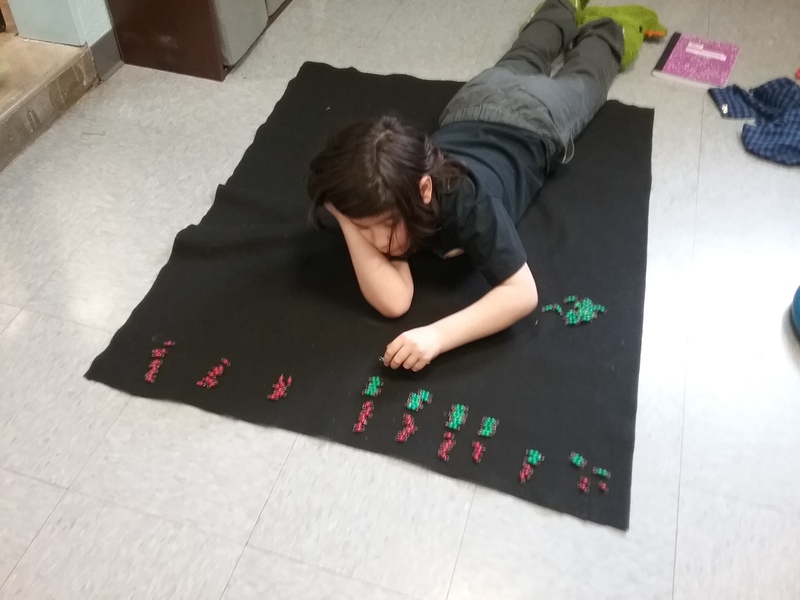 All of the practice with these bead bars will give him and our other students a metal picture of the multiplication equations they will solve throughout their time with us and as adults. This fourth year student is working to complete his Early Humans Timeline. 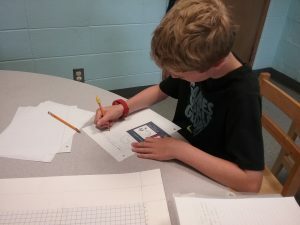 After completing his study of early humans from Australopithecines to the Cro-Magnon Homo sapiens, he created a timeline to show the periods when these humans walked the Earth, then wrote summaries of each species to add to his timeline with drawings. Check out his work next week in the hall! This second year student is reviewing types of triangles with Ms. Marlee. He is forming and naming triangles based on the length of their sides and the types of angles they contain. Here he has an equiangular equilateral triangle and a right-angled isosceles triangle. 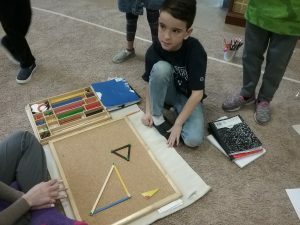 This month our second year students will continue to study triangles before moving on to writing simple proofs about quadrilaterals! These students have created a plan for researching the United States of America. They have traced many of the states and are recording important information like the date each state entered statehood, the state nickname, the state bird, and many other interesting facts. Working in pairs or groups requires a lot of communication and problem solving that is even more important than the great academic work they have independently chosen to complete. What a bittersweet moment! Our third year students have finished their study of equivalence with our Constructive Triangles and Metal Insets. Here they are working together to find a relationship between the apothem and perimeter of a decagon and the height and base of a rectangle. I have been so impressed by the ability of this group to work together with these challenging materials (remember last year when many of our parents could not figure them out?!) to communicate, give chances, and give encouragement to each other. They have been comfortable sharing their thoughts and ideas, even if they end up being wrong, which is something we could all probably learn from them! Next stop – PYTHAGOREAN THEOREM! Next week, we will continue to study and research Great Zimbabwe. Our first year students will add and subtract on a number line, will continue to study whole and straight angles, will discuss the parts of a leaf, and will begin studying Australia. Our second year students will begin compound multiplication by discussing standard and expanded notation on the Large Bead Frame, will continue studying triangles with the “Seven Triangles of Reality” lesson, and will find symmetry in flowers. Our third year students will record partial products on the Flat Golden Bead Frame, will move on to Pythagorean Theorem, and will study the main characteristics of mollusks. Our fourth year students will create a line graph on our Pegboard, will bisect the base of a triangle to find the area, will be introduced to fungi, and will complete a lab about properties of matter. Our fifth year students will build a cube to its successive cube, will be introduced to the Ancient Civilizations Timeline, and will study ocean currents. 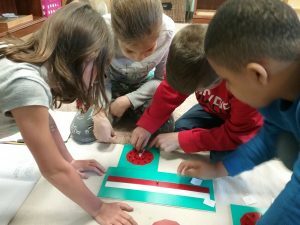 McKinley Museum Field Trip – Tuesday, April 9 – This is a bus field trip. We will be learning about Ohio history, dinosaurs, and will visit their planetarium. Please pack a disposable lunch for this day and be sure your child wears comfortable shoes. We will be walking up many steps to the McKinley Memorial.